Sweet and simple so it can be worn every day, the rhodium-finished necklace is cleverly made of a solid heart pendant laced through a hollow heart. 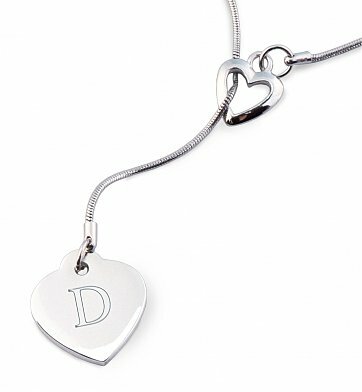 The solid heart pendant features a free engraved initial for a personal touch. One Rhodium-Finished 18" Lariat Necklace. Complimentary Engraved Initial on Pendant. Gift arrives presentation-ready in a signature GiftTree box. A free card with your personal message is included with your gift. Free Engraving! Engraving area: Single initial. Enter information to be engraved using the above Personalization Options button or during the checkout phase of the ordering process. Double Heart Lariat Necklace with Free Engraving is a hand delivered gift. These gifts are delivered by one of our local design centers located throughout the United States and Canada. Same day delivery is available for most gifts when ordered before the cutoff time. The cutoff time for Double Heart Lariat Necklace with Free Engraving is in the recipient's time zone. It arrived on time and she loved it so thats all good in my book. Thanks so much! I bought this as a gift to my sister on her birthday. She loved it very much. The delivery was quick and the necklace was wrapped/boxed well. Great service! And the gift is just perfect. This was a birthday gift for my niece who likes it and was impressed by her initial being on the heart. My sister loves it and shows it off to everyone and a few people asked where I got it from. MY sister loved it, we are about 450 miles apart and I wanted her to have something from me on her 40th birthday and this gift di it. Thank you so much. The delivery timing was great and my friend loved it. I wanted to get her something other than than a plant or flower to show my condolences for her loss. I bought this necklace as a gift on my daughters 16th birthday, its been a tradition in our family to give an inscribed piece of jewelry ay that time. It was shipped in 2 days in a cute little gift box with a personal msg card. My daughter loved it! Web display of product was accurately depicted. My mother loved this necklace gift. She lives out of state but sent me a picture of the necklace and message card that she received, which matched exactly what was displayed on the GiftTree website. My sister also gave me feedback that it was a gorgeous necklace.